Back in October, I was in California to check out the new 2019 Volvo S60, which I really liked. 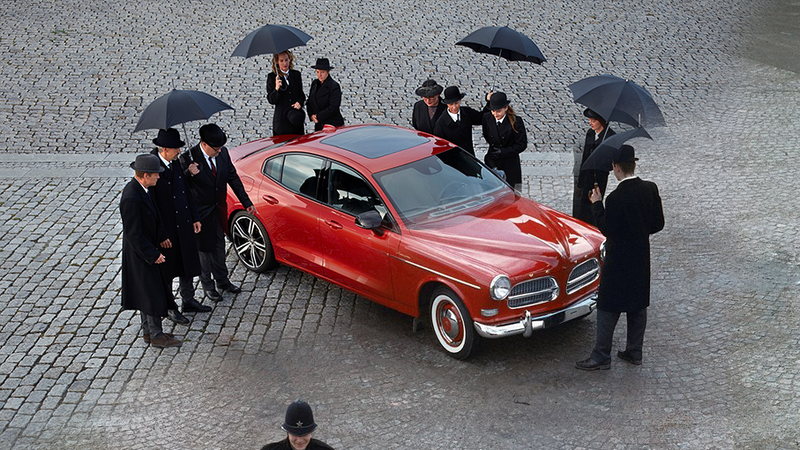 At a dinner with some of the folks at Volvo, a very kind, very tall Swedish man shared a photo of the car surrounded by people with bowler hats and umbrellas, and I’ve been trying to figure out why ever since. As it turns out, the women and men wearing bowler hats and holding umbrellas on a cobbled street surrounding the new Volvo S60 were not necessarily performing some strange Swedish ritual. Instead, the photo was posed as an homage to an old advertisement for the 1956 Volvo Amazon. Finally, seemingly out of the blue, a Volvo spokesperson got back to me about the two images to explain that the engineers behind the new Volvo S60 wanted to recreate the iconic image featuring the old Amazon, and there you go. Everyone you see in the S60 was an engineer involved in the development of the new S60 (everyone in the Amazon photo is just a hired model, apparently). It’s a nice little homage considering the S60 is now the first Volvo sedan to be manufactured in the U.S., as the 1956 Volvo Amazon was the first sedan the automaker sold stateside.